Henry was convicted of several criminal charges and was briefly suspended by the NFL. He later died when he fell from a moving truck. Post death investigation revealed that Henry had developed chronic traumatic encephalopathy during his playing career due to multiple hard hits to the head. While several former NFL players have been found to have the disease after their deaths, Henry was believed to be the first still-active NFL player to have the condition. Henry was born to Carolyn Lee and David Henry in Belle Chasse, Louisiana. He attended Belle Chasse High School where he was named New Orleans small schools offensive player of the year during his senior year. During that season the Fighting Cardinals made it to the Louisiana AAA State championship game, which was played at the Louisiana Superdome. Henry also excelled in basketball and track. Henry enrolled at West Virginia University in 2002, spending his first season as a redshirt. In 2003, he earned Big East Conference freshman of the year and All-Big East second-team honors for catching 41 passes and gaining 1,006 yards and scoring 10 touchdowns. He also became the second player in school history to record over 1,000 receiving yards in one season (behind David Saunders), and his 24.5 yards per reception are the third most in a season in school history. Henry's best game was a career-high performance of 209 yards and two touchdowns against Syracuse. His career-long reception came against Rutgers that season, an 83-yard reception. In 2004, Henry started seven games and caught 52 passes for 872 yards with 12 touchdowns. After catching three passes in a 30–18 loss to Florida State in the 2005 Gator Bowl, Henry announced that he would enter the 2005 NFL Draft. During Henry's sophomore season, he was ejected from a game at Rutgers University due to multiple unsportsmanlike conduct penalties and was suspended for the season finale against the University of Pittsburgh. His former Mountaineers coach, Rich Rodriguez, stated that he was "an embarrassment to himself and the program" for his conduct. Henry majored in athletic coaching education. Henry was the third player in Mountaineers' history to average more than twenty yards per catch for his career. Henry's 1,878 career receiving yards is eighth most in school history, while his 93 receptions are the 14th most. His 22 touchdown receptions are also second most in school history. Henry's six career 100-yard receiving games is tied for third most in school history. Henry was drafted by the Cincinnati Bengals in the third round of the 2005 NFL Draft. He made his NFL debut on September 18, 2005 against the Minnesota Vikings. In his rookie season with the Bengals, he amassed 31 receptions for 422 yards and six touchdowns. In the Bengals' first playoff game in fifteen years against the Pittsburgh Steelers, he had a reception for 66 yards on the Bengals' second play from scrimmage. However, on the play, both he and Bengals quarterback Carson Palmer suffered knee injuries. In his second season, Henry totaled 605 yards on 36 receptions for nine touchdowns, with an average of 16.8 yards per catch. On the second game of the season against the Cleveland Browns, Henry recorded five receptions for 113 yards, while he recorded two touchdowns the next week against the Pittsburgh Steelers. In the season finale against the Steelers, Henry totaled 124 yards off of four receptions and scored one touchdown. Henry was suspended for eight games in 2007 for violating the NFL's personal conduct policy. He returned in week 10 against the Baltimore Ravens, where he had four receptions for 99 yards. In the following loss to Arizona, Henry totaled eight receptions for 81 yards and one touchdown. Henry finished the season with 21 receptions for 343 yards and two touchdowns. Following his arrest in April 2008, Henry was waived by the Bengals. President Mike Brown explained that Henry had forfeited his opportunity to pursue a career with the Bengals and that his conduct could no longer be tolerated. On April 7, 2008, ESPN radio analyst and former player Michael Irvin said he took a phone call from Henry, discussing "cleaning up his act", much like Irvin encouraged Adam "Pacman" Jones to do. Henry and Jones were teammates at West Virginia, and both served NFL suspensions imposed by NFL commissioner Roger Goodell during the 2007 NFL season. With Bengals receivers Chad Ochocinco, T. J. Houshmandzadeh, and Andre Caldwell nursing injuries during the 2008 preseason, Henry was re-signed to a two-year contract by the Bengals on August 18. The move came less than a month after Bengals head coach Marvin Lewis stated the team had no interest in bringing back Henry. After serving his four-game suspension to begin the 2008 season, Henry was activated from the exemption list on October 4. Running back Kenny Watson was released to make room for Henry on the roster. Henry finished the 2008 season with 19 receptions for 220 yards and two touchdowns. He was placed on injured reserve in November 2009, after suffering a broken forearm while making a 20-yard reception against the Baltimore Ravens. On December 15, 2005, Henry was pulled over in northern Kentucky for speeding. During a search, marijuana was found in his shoes. He was also driving without a valid driver's license or valid insurance. He pleaded guilty and avoided a jail sentence. On April 29, 2006 Henry allowed three underage females (ages 18, 16 and 15) to consume alcohol at a hotel in Covington, Kentucky. One of the three, an 18-year-old woman, accused Henry of sexually assaulting her; she later retracted her story and was charged with filing a false police report. On January 25, 2007, Henry pleaded guilty to a misdemeanor violation of a city ordinance commonly referred to as a "keg law." He was sentenced to 90 days in jail, with all but two of those days being suspended. Henry was pulled over on Interstate 275 in Ohio on June 3, 2006 at 1:18 a.m. by Ohio Highway Patrol trooper Michael Shimko for suspected drunk driving. He voluntarily submitted to a breathalyzer test at 2:06 A.M. at the Milford Police Department and registered a .092 blood-alcohol level, .012 above the level permitted in the state of Ohio. On October 6, 2006 Henry was suspended by the NFL for two games for violating the league's substance abuse and personal conduct policies. NFL policies forbade Henry from taking part in practices; however, he was allowed to attend any team meetings. Henry missed the Bengals' October 15, 2006 game at Tampa Bay and their October 22, 2006 home game versus Carolina. In April 2007, Henry was suspended for the first eight games of the 2007 NFL season for violations of the NFL's personal conduct policy. His suspension on the 10th came with a stern warning that future misconduct may result in the end of his career with the NFL. Henry was given permission by NFL Commissioner Roger Goodell to begin practicing fully. His suspension was lifted and he played in the November 11, 2007 game versus the Baltimore Ravens, amassing 4 catches for 99 yards. On March 31, 2008, Henry punched a man named Gregory Meyer, 18, and threw a beer bottle through the window of his car. Henry claimed it was a case of mistaken identity and that he thought it was somebody else that owed him money. Henry was waived by the Bengals a day after this arrest and was then served a house arrest sentence. On December 16, 2009, Henry sustained fatal injuries when he fell out of the back of a moving truck driven by his fiancee, Loleini Tonga, and his friend Sam Pahnisch, while they were engaged in a domestic dispute. Tonga has three children by Henry. On December 17, 2009, Charlotte police announced that Henry had died at 6:36 a.m. ET at Carolinas Medical Center. Two days later, on December 19, police confirmed that Henry died of blunt force trauma to the head. No charges were filed against his fiancee, and police announced that they found no evidence that Tonga drove recklessly or with excessive speed. To honor Henry, every game of Week 15 (December 17–21) in the NFL began with a moment of silence before kickoff. On December 20, three days after Henry's death, the Bengals traveled to Qualcomm Stadium to face the San Diego Chargers. As with all the other Week 15 games, a moment of silence was held before kickoff. Bengals wide receiver Chad Ochocinco, a close friend of Henry's, openly wept during the silence. Later in the game, on his first touchdown reception, Ochocinco dropped to his knee and paid tribute to Henry in the endzone. In June 2010, the Brain Injury Research Institute of West Virginia University released a report that Henry had developed a brain disease called chronic traumatic encephalopathy during his playing career due to multiple hard hits to the head. While several former NFL players had been found to have the disease after their deaths, Henry was believed to be the first still-active NFL player to have it. The discovery that Henry had CTE has become a serious issue of concern for football and brain safety, especially since Henry was relatively young and had never been diagnosed with a concussion in any of his five NFL seasons or during his college career at West Virginia. Concern has been raised whether an accumulation of lesser blows could eventually be enough to cause brain damage. It was also believed that the brain damage Henry suffered may have been a factor in his numerous off-the-field incidents. ↑ USA TODAY (2005-05-18). "USA TODAY Article Chris Henry, WR, West Virginia". USA TODAY. Retrieved 2009-12-21. ↑ Snyder, Whitney (16 December 2009). "Chris Henry CAR ACCIDENT INJURY: Bengals Receiver Suffers 'Life-Threatening' Injuries In Crash". The Huffington Post. ↑ WVU Career Touchdown Receptions Archived November 6, 2007, at the Wayback Machine. ↑ Chris Henry Thinks Michael Irvin Can Help Salvage His Career – FanHouse – AOL Sports Blog Archived July 8, 2008, at the Wayback Machine. ↑ http://news.cincinnati.com/apps/pbcs.dll/section?category=blog09&plckController=Blog&plckScript=blogScript&plckElementId=blogDest&plckBlogPage=BlogViewPost&plckPostId=Blog%3ac78cbe8a-2b47-436d-a33e-62 Archived September 27, 2012, at the Wayback Machine. ↑ Pasquarelli, Len (2006-06-04). "Bengals' Henry arrested for third time since December". ESPN. Retrieved 2009-12-17. ↑ http://www.wcpo.com/news/2006/local/01/30/henry.html Archived November 9, 2006, at the Wayback Machine. 1 2 "NFL notes: Bengals' Henry heads to jail, may face NFL sanction". USA Today. Associated Press. 2007-01-25. Retrieved 2009-12-17. ↑ "Notes: Welbourn retires; NFL meetings continue in L.A.; Plaxico speaks; Henry pleads". USA Today. Associated Press. 2006-06-16. Retrieved 2009-12-17. ↑ Curnutte, Mark (2007-10-25). "Henry practices with team". Cincinnati.com. Retrieved 2009-12-17. ↑ Gettys, Travis (2007-11-08). "Bengals' Henry Threatened Valet Attendant, Police Say". WLWT. Archived from the original on 2008-07-04. Retrieved 2009-12-17. ↑ "Chris Henry Released From Jail". WKRC. 2008-04-04. Archived from the original on 2009-07-19. Retrieved 2009-12-17. ↑ "Bengals' Chris Henry dead at 26". Sports Illustrated. Associated Press. 2009-12-17. Retrieved 2009-12-17. 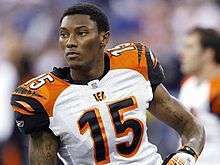 ↑ "Police confirm Bengals WR Chris Henry is dead". NBC Sports. 2009-12-17. Retrieved 2009-12-17. ↑ "Cincinnati Bengals' Chris Henry died of blunt-force trauma to the head". ESPN.com. 2009-12-18. ↑ Schwarz, Alan (June 28, 2010). "Former Bengal Henry Found to Have Had Brain Damage". New York Times. Retrieved 2010-06-28. ↑ Chris Henry data sound football alarm, ESPN. com, Johnette Howard, June 29, 2010. ↑ Zucchino, David (November 25, 2010). "Lost life revives four others". Los Angeles Times. Wikimedia Commons has media related to Chris Henry (wide receiver).